San Francisco has the perfect ingredients for a great bike ride – it’s bike friendly, has great weather (particularly in spring and fall) and has incredibly dramatic scenery. Over 50 miles of connecting bike lanes link neighborhoods and iconic areas all around the peninsula. The only downside, especially for the occasional biker, is that it’s hilly. Don’t worry though, because in creating bike-friendly routes, planners have figured out how to get around those dauntingly steep hills! Biking happens to be the transportation of choice for many locals and motorists are used to sharing the road with bikers. For people who just like to bike around wearing jeans and sneakers as well as for dedicated cyclists with great quads decked out in all the right gear, below is a list of great places see by bike in San Francisco. Hands down, this is the most popular ride. For novices, the easiest way to experience this iconic ride is on a narrated tour with one of several bike rental companies in the city. 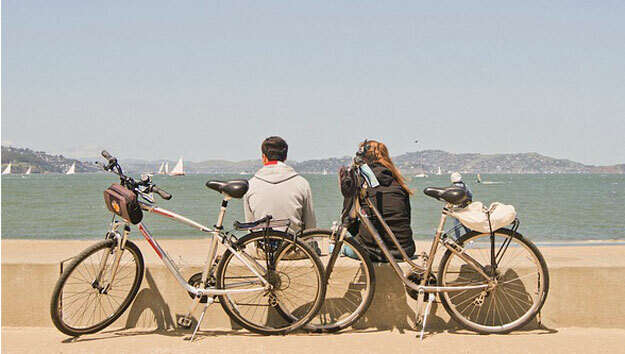 Bay City Bike Rentals offers daily narrated tours which begin at Fisherman’s Wharf, travel along past Aquatic Park, Fort Mason, over the majestic bridge, along Marin Headlands and into Sausalito. Bike and Roll offers a similar tour, as does Blazing Saddles. 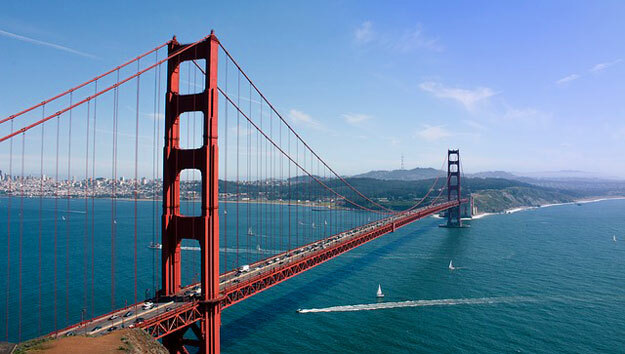 For the serious cyclist, or if you’re comfortable heading over the Golden Gate Bridge on your own, it’s a fabulous 7.1 mile ride with views, views and more views! Begin the ride at Fort Mason to cycle along the waterfront before hitting the big bridge. Once across, follow the bike lane to Sausalito. Find a bike rack or chain it to a parking meter to stroll through the picturesque, artsy town and have lunch at one of many sidewalk cafes. After your adventure is over, you can catch the ferry back to Pier 41. Dedicated cyclists who have 10 more miles left in them and want to see fantastic views, should follow the marked route with a dedicated bike lane from Sausalito to charming Tiburon, which has narrow streets, great restaurants for light bites or an elegant meal, boutiques and awesome bay and skyline views. Bicycling through San Francisco’s neighborhoods is a great, up-close way to experience the city, and it’s easier than you think. For the novice or once-in- awhile bike rider who is comfortable with riding in an urban setting, a narrated bike tour is the way to go. Bay City Bike Rentals offers a 4 hour, 15 mile tour through several neighborhoods including Little Italy, Haight-Ashbury, Mission District and along scenic Embarcadero and Fisherman’s Wharf. The ride is relatively flat and is comprised of dedicated bike lanes and some bike paths. It’s an unforgettable ride with great views and interesting sights you might otherwise miss. Dedicated cyclists will want to ride along popular bike routes encompassing several neighborhoods. First and foremost – The Wiggle is a must. Famous in the biking world for its series of twists and turns through Duboce Triangle and Lower Haight area, it will get you from the center of the city, beginning at Market and Duboce Ave, to the west side on relatively flat ground. Depending on the level of ambition and leg strength, from there follow the green bike arrows heading west along the bike route to Golden Gate Park, and on to Sunset District, Richmond and Western Addition/ NOPA (North of the Panhandle), which has a remarkable collection of old Victorian homes and some great places to eat. Or, cruise through the Mission District between Market and Cesar Chavez along flat Valencia Street. With a bike lane as well as bike corrals all along its path, it also happens to be San Francisco’s best foodie street. Being able to secure your bike makes stopping, exploring, enjoying a delicious small plates of tastes from all over the world and browsing quirky boutiques fun and easy. With over 8 miles of biking trails ranging from beginners to advanced, a trip to Angel Island is a must! Experience the amazing 360 degree views of the Bay and learn the park’s long history, from a hunting/gathering ground of native peoples to an Army post for 100 years and the entry point of thousands of immigrants. Getting there on the Blue and Gold Fleet Ferry from Pier 41 is half the fun. Rent bikes ahead to take on the ferry or rent them from the island’s concessionaire. The ride is a loop around the island on six miles of paved road. No cars are allowed on the island, making it a stress-free way to experience nature. If you bring a picnic, there are plenty of scenic spots along the loop to spread out a blanket and just hang out. Or, Cove Café serves food made from veggie’s grown in the island’s organic garden. Cove Cantina Oyster bar serves oysters, beer and more and has live music in the summer months. For the more serious cyclist, add on the 3 mile upper loop on the fire road, where the vistas are even grander! A bike lane runs along the edge of the bay where the views are spectacular and the things to do make it a great way to ride and sightsee. Start on the east side at AT&T Park, home of the Giants, and head around the Embarcadero to Fisherman’s Wharf. Ionic sights and picturesque vistas pop up all along the way. Just beyond AT&T Park, the Bay Bridge to Oakland stretches out in the distance. Next is all the activity around the end of Market Street at the Ferry Terminal, a great place to stop and browse through the market stalls inside. Cycle past the Financial District from which rises the distinctive TransAmerica Pyramid. If kids are along for the ride, the Exploratorium is a must stop. Look west for Coit Tower atop one of the Twin Peaks and check out the activity on the piers along the way. Fisherman’s Wharf is filled with people, attractions, souvenirs, food and plenty to do. Pier 39 is a fun stop if you are into all things tourist and to see sea lions frolicking and Pier 41 is where the ferries take off for Sausalito and Tiburon. Make it a full day by stowing your bike on the ferry and head over to either one of these picturesque towns. Green and beautiful, the 9 mile loop around the scenic park has many pleasant and interesting detours along the way. If you start at The Wiggle, pedal along the buffered bike lanes on Oak Street or Fell Street through the Panhandle. When you get into the park, proceed along the bike path on JFK Drive. Detour off to visit de Young Museum, the Academy of Sciences or the Japanese Tea Garden. Bear right on JFK Drive then left on Great Highway, which travels between the park and the mighty Pacific. At MLK Drive, head back east past verdant meadows and Stowe Lake, Botanical Gardens and back out again. Dramatic ocean overlooks, hills, historic forts, and beautiful natural ecosystems unique to this area characterize Presidio. A U.S. Army base for 148 years, whose prior occupants included Native peoples, the Spanish and the Mexicans, the site has a rich history. A visit to Fort Point at its very northern tip is a must to experience the sensation of massive Golden Gate Bridge looming above. The National Park Service has a helpful downloadable Bike and Trail map to find which suit your skill level. Bike parking is available throughout the Presidio so you can lock it up and hike up to a battery or a dramatic overlook. For a sightseeing break or if the fog rolls in, stop at the Warming Hut for a warm drink and food. This cliff-hanging ride is for seasoned cyclists who bring their own bikes. Most of the trail is dirt, and it’s important to stick to it because the cliffs are slippery-steep. There are also stairs to navigate and areas where bikes are not permitted. The effort is worth it though, because the views are spectacular. You’ll see the Golden Gate Bridge in the distance, scenic overlooks of the Pacific Ocean boiling against the rocks way below and the Marin Headlands to the north. Dangerous outcroppings along the cliffs jutting into the Ocean have led to countless shipwrecks since the Spaniards first discovered the bay. If the tide is right, some are visible from above. 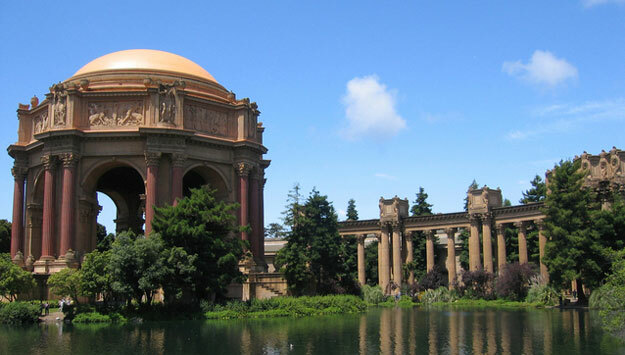 Stops off the trail include Sutro Baths ruins and the Palace of the Legion of Honor. Upon returning to Merrie Way parking lot after the 4 mile loop, end a great ride with a drink and lunch with fabulous views at the Cliff House. Pack a picnic and head south for 4 relatively flat miles down scenic Great Highway from the windmills on the northwestern edge of Golden Gate Park to oceanfront Fort Funston National Park. This recreational area has cliffs that are 200 feet high and on windy days are favorite spots for hang gliders. Many steep hiking trails lead down to beaches for great coastline exploring. 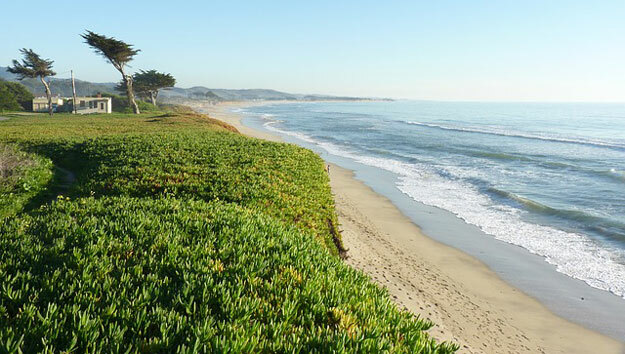 Drive 45 minutes down to Half Moon Bay for a picturesque, 5 mile ride along Half Moon Bay Coastal Trail. It’s a paved trail stretching between Pillar Point Harbor on the north end and Poplar Street on the south end. You’ll be amazed by the sweeping views of the Pacific Ocean, enjoy access to several beaches, and spot birds along the way. Half Moon Bay State Beach also happens to be home of the Mavericks, a surfing spot near Pillar Point visible from the trail where winter waves can reach up to 80 feet! The trail connects Half Moon Bay’s beaches and goes through small idyllic communities dotted with restaurants, small coffee places and bakeries and even fish houses along the way. At several points the trail joins a local road or crosses it. Venture on those for an interesting adventure then pick up the trail down the road. Bring your bikes or rent them on location.